We make pizza about once a week. Normally I make my pizza sauce each time by sauteing onions and garlic, adding diced tomatoes and then sprinkling in the spices and cooking for 30 minutes. All the while getting splatters of red sauce all over my stove and counters. No more! My goal was to can a pizza sauce that I could use straight out of the jar. I bought a bushel of tomatoes at the farmer's market. A bushel of tomatoes is about 50 pounds! I could barely lift it. Actually, I couldn't lift it. The guy who sold it to me had to hoist it up and then I could carry it to my open trunk. 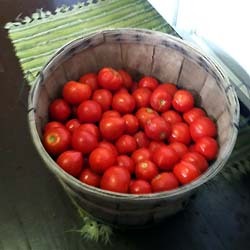 Once I got home I transferred half of the tomatoes to a five gallon bucket so I could bring them into the house. My excuses are I just had a baby... a couple months ago and that this photo doesn't do it justice. That's a lot of tomatoes. If you want a bushel of tomatoes stop by your local farmer's market or farm stand and ask the sellers if they will sell you a bushel of seconds or canners. At my farmer's market I have to pay in advance for a bushel and then pick it up the next week. Or I have to get their really early in the morning to just walk up and buy a basket. Maybe once the season peaks it will be better. Hopefully next year I'll have my at least part of the lawn turned into garden and I'll be canning my own. I use two pieces of equipment that make it easier to sauce: an immersion blender and a food mill. They come in very handy so that I don't have to blanch the tomatoes or strain them. Here's how I made pizza sauce. First I cleaned and took the stem off all the tomatoes that still had that part. Then I cut out the top where the tomato attached to the stem and quartered it. What makes this more than just tomato sauce is the addition of Italian spices, onions and garlic. I sauteed the garlic and onions until the onions were glassy. Then I threw in as many tomatoes as I could and simmered for twenty minutes. There is no need to add water the tomatoes will break down and become juicy quickly. It was important to stir frequently to keep things cooking evenly. I wish I had a big pot for this step, but I had to settle for batching them in my two 8-quart pots. Until I started canning I thought I would never need anything bigger than the 8-quart! I'll have to keep a look out at garage sales and Good Will to see if I can find a huge pot for canning things like tomato and apple sauce. It would also come in handy for making stock. 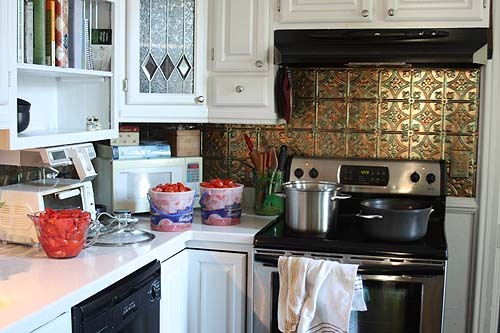 In the photo above you can see the quartered tomatoes waiting their turn in the pot. I am pretty sure at this stage there were still uncut tomatoes waiting in the sink as well, but I had run out of containers to hold them. After they simmered for 20 minutes, I took out the bay leaves and used the immersion blender to make a lovely tomato pulp. If you don't have an immersion blender you could also batch in a blender or food processor. Or I guess you could just run it through the food mill and you would just have to crank longer. You can also see, in the picture above, the shelves my handy husband built for us to keep the jars of bulk food. Hooray for not having to dig through the deep pantry shelves anymore! After smooshing all the tomato puree through the food mill, the seeds and skins were be left behind and I had a rather thick juice that goes back onto the stove. I simmered it for most of the evening, stirring every so often to prevent burning. I should have reduced the volume by half. I thought it was thick enough when I had reduced the volume by about one third, but it wasn't. I should have kept going. So I'm not calling what I made pizza sauce. It will now be used for lasagna and spaghetti sauce. I'll have to make some more and get it thick enough for pizza sauce. It's no good when the sauce runs off the pizza. Then while the sauce was still hot I ladled it into jars and boiled it in the water bath canner for 35 minutes. I used about 45 lbs of tomatoes and came up with 18.5 pints of sauce. A pint is about the perfect amount for two of our pizzas which is why I didn't do quarts. I like not having to keep leftover sauce in the fridge where it could potentially go bad. If I had reduced the sauce as much as I should have I would have yielded 14 pints. I am convinced this is a good recipe if I actually followed it. I plan to put up another three bushels of tomatoes. About 100 pounds as pizza sauce, 25 pounds as enchilada sauce and 25 as sun-dried tomatoes. And if I can find more tomatoes I'll make some canned tomato soup. And I'll probably still be buying tomatoes this winter for things like lentil soup and curry! Crazy how much tomato we eat. Sterilize the jars by boiling in the water-bath canner for 10 minutes and pouring boiling water over the lids, keep them upside down on a clean towel until ready to use. Clean and wash tomatoes. Remove the top part where the tomato attaches to the stem and then quarter. Set aside. Sautee the onions and garlic in a huge pot with the olive oil until the onions are glassy. Add the quartered tomatoes, oregano, bay, pepper, honey, salt and jalapeno. Simmer for twenty minutes. Remove the bay leaves and puree the tomatoes either with a stick blender in the pot or batching in a blender or food processor. 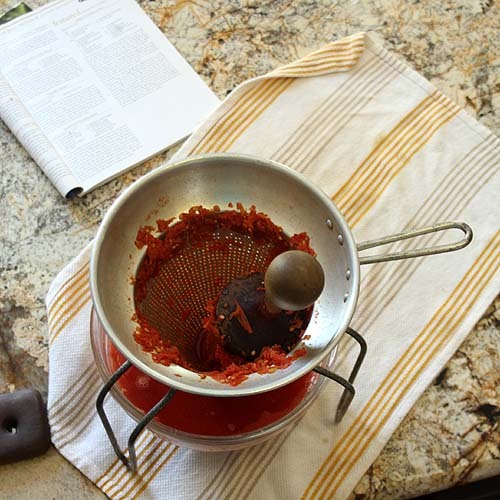 Strain the pureed tomatoes through a food mill or colander to remove seeds and peels. Cook the pulp on the stove uncovered, over medium-high heat stirring frequently until the volume is reduced by half. You should have about 7 quarts. Add one tablespoon of lemon juice per pint or two tablespoons of lemon juice per quart then fill each jar leaving 1/2 inch head space. Put on the cap and screw band. Process in a water-bath canner for 35 minutes for pints and 40 minutes for quarts. Open this sauce and pour directly on pizza crust and top with your favorite toppings and bake! Might I suggest: spinach apple feta pizza, egg ramp goat cheese pizza or any of the other ideas here. Enjoy! Let me know if you give this recipe a whorl in the comments. You made making Canning Pizza Sauce and Tomato Sauce seem so simple! Would you join us in our food community www.mycookbook.com and let us know how you worked on the Canning Pizza Sauce and Tomato Sauce perfectly ? We had pizza last night and you are making me want it again, ha! Good thing I brought leftovers to work for lunch! :) What recipe do you use for your crust? We have tried several and haven't found one we love...last night we cheated and just used cresent rolls! Definitely going to try this. I process about 4 bushels of tomatoes annually and always looking for new recipes to try! Making tomato jam tonight :-) Happy Canning! Looks good! Do you think at the ending stage you could freeze the pizza sauce instead of canning it???? Stop by my blog Friday for the next edition of the Carnival of Home Preserving! Would love to have you by and link up this post or other great preserving posts of yours. Do you have a water bath canner that you recommend for the beginning canner? I've been using the tomatoes from our garden by blanching/peeling them, crushing them, and just boiling them down about halfway, then freezing them in cup-sized containers - this way I can add them as-is to chilis and soups or cook them down with other ingredients later to make pasta sauce, pizza sauce, etc. More work on my end later, but more flexibility through the winter. You don't need anything fancy for a first canner. Pretty sure mine came from a garage sale. All you really need is a rack so that the jars don't touch the bottom directly. Hardware stores generally have them in stock. You could also buy a pressure canner if you think you'll ever get into non-acid canning and use it as a water-bath canner too. I use every piece in it! Yum, this looks great. I haven't ever canned so I am afraid of doing it wrong! What are your best tips to ease by mind beside folliwing the directions step by step? Apparently I just sent you a blank email. Whoops. Canning is one of those things that you just have to do it. This is a particularly long recipe. It took me several days to execute. If you are a beginner canner try jelly or pickles first. They take about 2 hours start to finish. 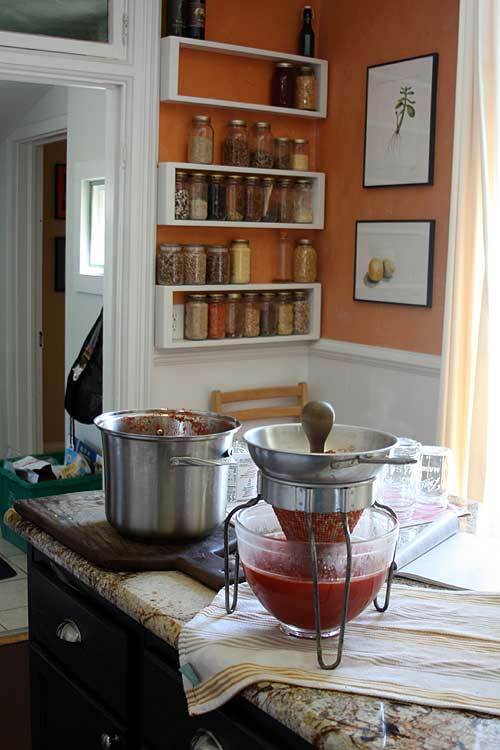 Then once you've figured out how to sanitize, fill and seal your jars with food inside move on up to tomato sauce! Or if you are gutsy just go for it. The worst that can happen is you'll learn something, right? Such a great idea! I've only made sauce from scratch a couple of times and it makes such a mess - so smart to do it all at once! What a great recipe to try with all the wonderful tomatoes that we have from the garden right now. Hope you have a great holiday weekend and thank you so much for sharing with Full Plate Thursday. I pined this...I love it. I preserve a little but really want to do it more. Great post, great recipe..I cannot wait to try it! I am so impressed!! I never used store-bought tomato/pizza sauce anymore and it does make a huge mess. Look at this!! I could make my own and have it ready in advance!! BTW, your kitchen is gorgeous. I love the color you used on your walls! thanks for sharing a Foodtastic Friday! That certainly looks like a lot of work...but I bet it is so worth it!! I admire that you can do things like this. Canned Pizza Sauce Recipe is superb taste using tomatoes. This recipe is good in taste and very simple process. i found new Tomato Dal Curry recipe and cooking method is very easy at home. 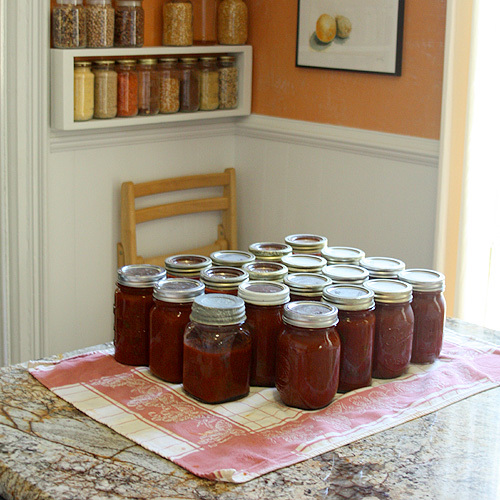 I can hardly wait to get into canning. Thank you for the recipe! I really need to do more canning-thanks for the inspiration and delicious recipe. Thank you for sharing with us on Allergy-Free Wednesdays. As a reminder, in order to be featured, please provide a link back to one of the AFW Hostesses. Have a lovely week! I just wanted to let you know that I just canned up a batch of this pizza sauce. There was a little left, so I made a greek pizza. It was really so good and fresh tasting! Love it! I'm glad you like the recipe. Onions and green peppers are some of my favorite toppings. In fact that's what we had on one of the two pizzas I made last night with the sauce. :) Must be that time of year. Your sauce looks yummy! If you want a thicker sauce, just stir in some tomato paste when you open your jar! I can a tomato sauce with onions, celery, summer squash and zucchini. I use it for soups, sauces, stews or just plain. I am glad to see so many folks canning their own food. It's so much better! I love that foodmill! I'm going to have to watch for one like it. Thanks for sharing at Scratch Cookin' Tuesday! I know what you mean about thinking an 8 quart pot huge until you start canning. Thankfully a friend of mine gave me a 20 quart pot she had found for $0.25. I'm so jealous of your 20 quart pot for 25 cents. That's a deal you don't find twice. 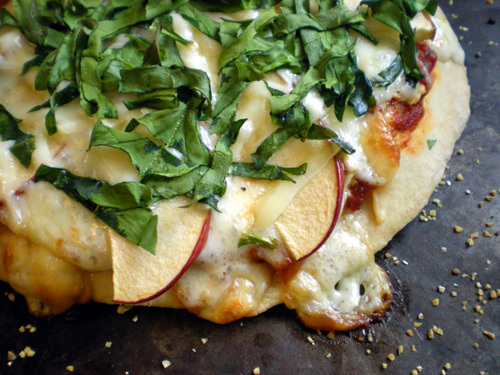 This looks great--we make pizza all the time but although our crust is homemade, not the sauce. I love your custom shelves too! Like your blog. I think a better and faster product are the Norpro sauce makers. Much faster than a food mill. You just crank the handle and it separates all the seeds and skins from the juice and meat of the tomatoes. Also, we roast all or most all of our tomatoes on the grill. That is where I put in the extra work. But the tomatoes go through the sauce maker (or the mill) much better when they are cooked even a little. I just roast them long enough to get some black stripes on them and allow them to open. What a difference it makes. The Hawkins mentioned they have a crank machine that takes out the seeds and skins of the tomato. I bet they have a Norpro sauce maker. I'll get to try it out when I help them make their tomato sauce this fall. Perhaps I'll need to borrow it! Yep! See the odd looking lid? That's a zinc refrigerator lid. I didn't process that little bit. I kept it in the fridge and used it on the pizza we made on Friday. You're right, you need a head space of 1/2 inch for proper canning of tomatoes. Very nice recipe! Thanks for the tips. We do about 200 pounds of tomatoes into sauce/whole/diced every year, but I have not yet branched out into canned sauces. Now that I have a food pH tester, I'll be able to make sure my sauce acidity is OK for water-bathing. Tomatoes are considered borderline, and when you're adding a lot of other low-acid ingredients (onion, peppers, garlic, etc), then it can make the difference between being acidic enough to be safe (with a little lemon juice) or not (even with the lemon juice). A great way to get pots is garage sales and craigslist - I watch for 'crab pots' and 'turkey fryers'. I don't get aluminum, though, unless it's clad in stainless steel - nothing like having your tomatoes taste metallic because they reacted with the metal. We do all our processing outside on a 3-burner propane camping stove, which is (a) way faster, and (b) keeps the mess out of the kitchen! If I'm doing sauce, I run all the tomatoes through my Vitamix after taking the stems out. It blends all the seeds and skins so finely that they're undetectable in the final reduced sauce. Hooray for home canners! Good post - I'd just check with my local extension agent to see if my recipe looked like it was acidic enough for water bathing (or test the pH) to make sure it's safe. Good info! I don't live anywhere near a coast to get crab pots, but I bet a turkey fryer will come up eventually on Craigslist. I hadn't considered those as a an option. Good thought! This recipe should be plenty acidic as it is basically a Ball Blue Book recipe with the spices changed out. You are welcome to check with who ever you like to see if it is up to snuff. Very nice explained recipe! Thanks for share. 1) You can use a pressure canner as a large pot. It is larger than anything else I have (besides my WBC). Just don't seal the lid. This would be great for any old pressure canners you come across, but don't feel confident canning with. Mine also seems to not burn food as quickly as my other pots. Don't know I would guarantee that, but I left sauce cooking for 3 hours once and it didn't burn. 2)If the sauce doesn't come out as thick as you would have like it, pour it through a colander right before using. This will help remove any extra juices. I have done the same thing when using homemade spaghetti sauce for pizza sauce, before I started canning pizza sauce that is.